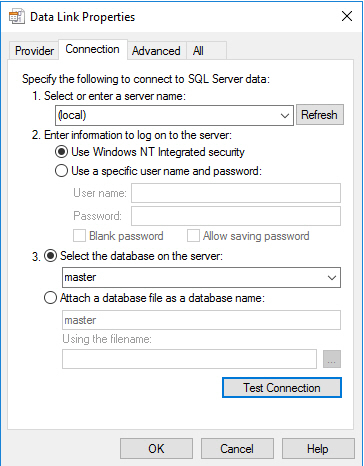 After installing a SQL instance, we may need to test the database connectivity from a client host to make sure that everything is working very well, for instance, sometimes Windows Firewall might block access to the service or there might be network issues. Moreover, in the likely event that there was no time to install SQL Server client tools such as SSMS or SQLCMD to carry out the test, you woud be a bit suprised to know that there is a simpler way to do it, that is via a Data Link file. Consequently, in this post I am going to show you how to create and use a Data Link file to test connectivity to a SQL instance. To begin with, you must open Notepad to create an empty .txt file and save it with the .udl extension as you can see in the following picture. After doing that, you must open the .udl file and you will then see the following window with four tabs. The second tab "Connection" is to fill with the server name (or SQL instance name) and the credentials accordingly. For instance, I am testing the connectivity to a default SQL instance and using Windows Authentication. You must modify that to serve your needs. In the first tab "Provider" we can choose the Provider to use in the test. By default, it is always "Microsoft OLE DB Provider for SQL Server". It is ideal to test other providers as well. It is worth noting that SQL Native Providers will be listed if SQL Client tools are installed locally in the client host from where the test is done. In the tab "Advanced" it is possible to set the timeout value whereas in the tab "All" we can see a summary of all the settings, and we can also edit the values of some important connection parameters such as "Language", "Connect Timeout", "Packet Size", "Data Source" and "Initial Catalog". Finally, we just have to click on "Test Connection" in the tab "Connection" to proceed with the test. 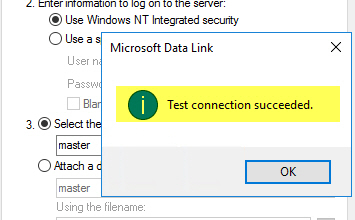 If the connectivity to the SQL instance is ok, you will see the message "Test connection succeeded", it couldn't have been simpler! That is all for now. I hope you find this post helpful and practical. Let me know any remarks you ma have. Stay tuned.